In the April Edition of Tech News we are featuring some of our new and most popular products from ASI. When your requirements call for solutions mandating the utmost in quality and performance, please look no further than ASI to meet your needs.The products listed herein are all manufactured to the highest industry standards, yet you will find them to be very cost-effective when compared to competitive products in the market.As always, you can count on your ASI Product Specialists to assist in of the products contained in our portfolio. ASI Offers the Widest and Most Comprehensive Array of Printed Circuit Board Terminal Block Connectors!! In early 2016 ASI dramatically expanded our offering in Printed Circuit Board Terminal Blocks. It is now easier than ever to select and specify from the full gamut of products you will find in this family. This expanded portfolio of products will make it easier for our valued customers when seeking the perfect solution to meet your requirements. 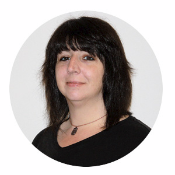 When Time = Money, why spend time seeking solutions from multiple suppliers when you can ONE-STOP SHOP at ASI-EZ? There are over 250 family groups that contain over 5,000 Part Numbers. With such a complete list of products to select from we are confident that you will find the Right part to fit your every need. Another resource to make your search easier is our new catalog for your use as needed. By using ASI's Printed 2016 PCB Connectors Catalog you will find a complete overview of the various styles of products we offer. Or if you are "old school" like me, we would be pleased to send you a personal print copy by using the "Request A Catalog" button. As always, the ASI Sales Team is available to answer questions, suggest products and provide whatever support and guidance that you may need with ASI products. Feel free to contact us at any time. We welcome you to visit our website PCB Terminal Blocks to find extremely detailed information on all of these products. Product Solutions for Industrial Ethernet from ASI-EZ! 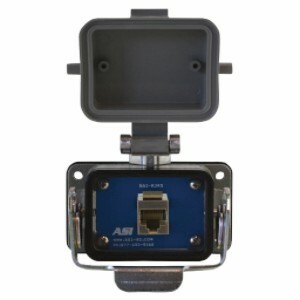 In the emerging area of Industrial or Factory Grade Ethernet communications, ASI offers many products to meet your needs. The migration of Ethernet protocols from the office space to the factory floor has uncovered the need for heavy duty and harsh environment protection and security when cabling specifications are under evaluation. These industrial type installations, particularly machine to machine interfaces, are calling out the requirement for Category 5E & Category 6A Industrial Ethernet Cables. All ASI Heavy Duty Industrial Ethernet Cables are bulk packaged in 1000 foot reels. 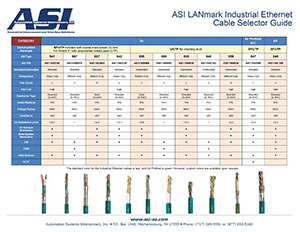 Based on the more stringent requirements found in the factory, ASI invites you to consider ASI Heavy Duty Industrial Ethernet Cables. Other Product Solutions from ASI-EZ! The RJ45 Interface is one of the most popular Ethernet connections being used today. This product is a bulkhead panel mount style that will provide IP67/NEMA 6, dust & liquid protection (when used with ASICPICPC) on the external wall of the enclosure or panel in your system or equipment. 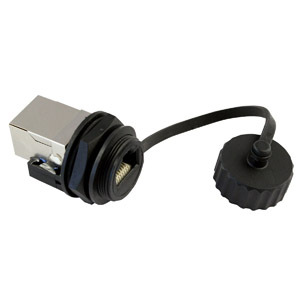 The Waterproof Protection Cap may be used for either the RJ45 interface or USB2.0 bulkhead panel mount style connections to bring the sealing level to IP67/NEMA 6 protection. 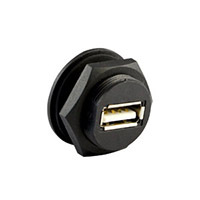 The USB2.0 Type A Interface Connector is front panel mount, shielded and IP67 rated. This product can be conveniently bulkhead mounted to your panel or enclosure. The same sealing cap (ASICPICPC) can be used on the USB that is used on the RJ45 connectors. The Remote Access Interface Connector with locking cover should be used when access to an internal panel or enclosure is required without opening the main doors of the device. The Remote Access Interface Connector is available with either a shielded RJ45 or an unshielded RJ45 (RAI-RJ45US), depending on your application. This product is ASI's Standard RJ45 Interface Module for quick and easy installation on DIN Rail inside of your panels and enclosures. 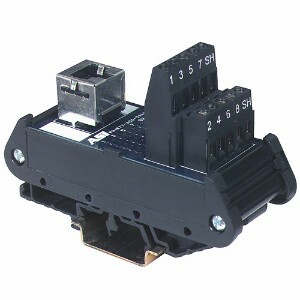 By connecting into the shielded RJ45 connector on one side of the module, you can simply transition to terminal blocks for ease of wiring inside the enclosure. Cable Glands- Choose from our wide assortment of Cable Glands that provide watertight protection for your equipment, controls, panels and enclosures when cables require entry into the unit. to assist you with any product purchases.